Last year was a deadly one for bikers and pedestrians on Colorado roads, as the number of fatalities, which has been on the rise since 2002, spiked more than 60 percent from 2011 to 2012. Cyclist fatalities, which have climbed 44 percent in the last 10 years, increased 63 percent in that one year time frame alone in Colorado. Pedestrian deaths rose 66 percent between 2011 and 2012. The growing problem prompted the Colorado Department of Transportation to launch the, “Share the Road, Friend” campaign, a statewide public outreach effort that will encourage all road users to be cautious of one another on Colorado’s streets and highways. 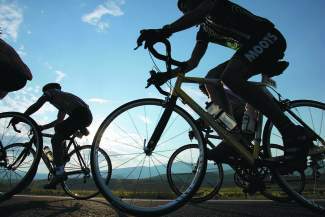 The campaign will include a grassroots outreach effort across the state and focused advertisements, in print, on billboards and on the radio in Denver and Pueblo, two of the most dangerous areas for bicyclists and pedestrians. CDOT is intentionally avoiding singling out drivers, putting the onus instead on all road users to be responsible. After working with the public and leaders across the state on the issue, transportation officials said they are aware that road use conversations can spark conflicts between users. The most recent pedestrian fatality on the road in Summit County was in March of 2012.